Located in one of Cleveland's most heralded neighborhoods, The Tudor Arms Hotel Cleveland - a DoubleTree by Hilton is situated in the city's refined University Circle area, featuring some of the most sought-after attractions and historically-prized destinations. Built in 1929, the hotel has been restored to its original glory and remains a coveted meeting place for Ohio visitors and guests of exquisite events. Boasting a variety of onsite outlets and a proximity to Cleveland's downtown district, The Tudor Arms Hotel is a glorious oasis from a busy city ambiance, and a welcome retreat into Cleveland's historical sector. With 157 elegant guestrooms, guests can bask in the property's vast legacy and enjoy its classic Tudor Revival architecture. With murals supplied by a local artist, ornate décor touches, and a relaxing ambiance promoted by sophisticated fireplaces, the hotel remains an essential respite for Cleveland's numerous visitors to experience complete rejuvenation alongside their explorations. The Tudor Arms Hotel was designated as an entertainment haven from 1939 through 1960, and featured famous jazz performances within its ballroom spaces. Deposit: $50.00 per day. Credit card is required for reservation. Early Check-In/Late Check-Out: Early Departure Fee: $69.00. Late Check-Out Fee: $69.00. Hotel/Resort Fees & Taxes: 16.5% varies per year. Parking: Self-parking fee: $20.00 per day (in/out privileges). Valet parking fee: $20.00 per day (in/out privileges). Secured: Available. Covered: Not Available. In/Out Privileges: Available. Shuttle Service: Area shuttle service available and complimentary. 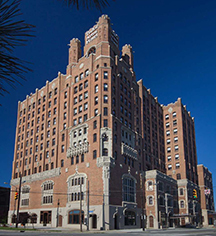 Located in one of Cleveland's most heralded neighborhoods, The Tudor Arms Hotel Cleveland - a DoubleTree by Hilton is situated in the city's refined University Circle area, featuring some of the most sought-after attractions and historically-prized destinations. 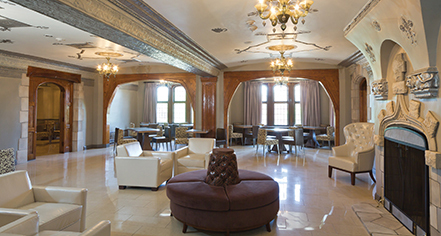 Learn more about the History of The Tudor Arms Hotel Cleveland - a DoubleTree by Hilton .